The Hideaway has been welcoming visitors looking to 'spread out' and relax on their vacation to this quaint town for years. Our home was built in the 1800's and has stood the test of time and brings repeat visitors back year after year. We're located in a quiet peaceful neighborhood just 2 1/2 blocks from Ludington Avenue (the main street of Ludington) and just five blocks from the marina, lighthouse and large public beach that makes Ludington famous. With its large size, our home is great for large and extended families or friends looking to get together. Home Description: Downstairs features lots of room with three bedrooms (king, queen, double), a spacious living room, formal dining room, large kitchen, laundry room and bath making it perfect for families. extended families or groups of friends. The upper level consists of an eat-in kitchen, living room, bath, king bed in the master bedroom and a second bedroom attached to the master that consists of four single beds as well as room for sleeping bags or air mattresses. 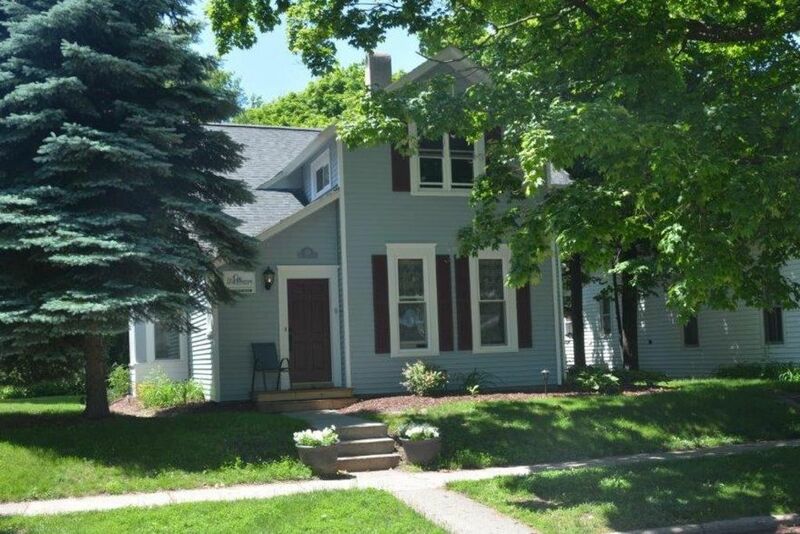 This is perfect for couples, couples with small kids, or friends looking for an affordable way to enjoy Ludington. Things to do: Each year, visitors leave comments about their stay in a book for them to leave their memories. One thing is certainly true: the saddest part of the trip is when it is time to go. They love their stay in our home and enjoy the many wonderful options that are in walking distance to them: downtown and its shops, restaurants, bars and antique stores, the public beach, the lighthouse and marina. Visiting the State Park is a seven mile beautiful bike ride with the water on one side and sand dunes on the other. With an ice cream store and downtown in walking distance, kids love the ability to seek-out adventures or a scoop of ice cream on their own. Each morning and evening, you'll hear the Badger car ferry sound its horn and if there is a bit of fog in the early morning or late at night, you'll listen to the sound of a lighthouse letting ships know where it sits. We hope you'll enjoy your vacation in about as relaxing a place as we believe you'll find anywhere. Window unit for one bedroom downstairs; both bedrooms upstairs. Get good breeze off the lake too. Lower unit: New dishwasher in 2014. Note: No dishwasher in upstairs unit. Lower unit: New frig in 2014. Lower unit: New stove/oven in 2014. Lower unit: New microwave in 2014. There are two kitchens: one downstairs and one upstaris. The downstairs kitchen was completely gutted and remodelled in 2014. It features all-new new windows, cupboards, counter tops, and appliances. Lower level has a formal dining room off the kitchen that is great for large groups. Upper level has a small eat-in kitchen, perfect for couples or small families. Laundry facilities on lower level only. We went to Ludington for a wedding. The Hideaway was minutes from everything by car, but when the activities were over and we had a few days, just my husband and me, we walked to the marina, the beach, the shops on Rt 10. We ate at House of Flavors, walked there! Sportsman Pub, walked there! The house was wonderful. Kitchen was great. Had everything you could want. Great bunk room upstairs, my grandkids loved it. The 12 year old said the house was cosy. This was the first time I have used VRBO. Great experience. Will definitely use them again. The price was great and if I lived closer (we live in NH) I would go back in a heartbeat. We traveled with our daughter and her family, and rented both the upper and lower units. This worked well, allowing each of us some private space. This is an older home, so don't expect everything to be modern or perfect. It is old, but clean and lovingly cared for.There is some peeling paint in the dining room, but on the whole, the place feels homey and welcoming. We see that the owners have been gradually making improvements, and we were able to relax, spread out and enjoy the place. The main floor kitchen has been remodeled completely, and had everything we needed for cooking. The beds varied in comfort level, there were plenty of pillows and extra bedding supplied as well as towels for the bathroom. If you come in summer, you may enjoy dining in the outdoor patio area. We couldn't get any of the keys to work, but using the lock box code each time worked just as well. Light switches were hard to locate, and some lights still have the old style pull chain. The upstairs unit has a shower, but it is located in the hall, so stepping out of the shower exposes one to the view of anyone else in the unit. The location is great, on a quiet street in town. We were within walking distance to the beach park and the pier, and also to the House of Flavors. We were able to park our 3 vehicles off street behind the house. We would recommend this place to other large groups looking for budget accommodations in Ludington. If you don't mind the fact that it is an older home, I don't think there is a better value to be found anywhere in the whole town. Great for groups. Rent the whole house! Great option for a large group staying in Ludington. We were there for a wedding and there was space for a group to gather both in and outside. Very clear directions to get in using key codes. Very clean. Many areas are redone. Bathrooms are old and the claw foot tub/shower is awkward but serviceable. Air conditioners are helpful. Close to everything on foot. Spacious, clean, great location, comfortable, lots of character! We enjoyed our stay at the Hideaway of Ludington! Our daughter and her husband and their two young children stayed in the upper unit and my wife and I shared the lower unit with our other daughter and her husband. The accommodations were perfect for our needs: lots of room for all of us to gather in the lower unit for meals and games; privacy, comfort, and quiet for each and all of us to sleep each night. 4 blocks to the beach in one direction and 4 blocks to downtown in the other direction made the location ideal for us. The kitchen has been fully updated and worked really well for preparing large meals for our whole gang. There was ample seating, too, for all 8 of us--inside and at the outside sitting/dining area (which was also very well appointed). The bathrooms were funky but very clean. The living room and dining room were spacious and there was plenty of lighting for us to read or do puzzles (some additional lightbulbs would make it even better, though). Our host, Mike, and the local property management folks communicated clearly and well. All in all, we loved staying in this old house--and, the next time we return to Ludington, we would stay there again! We really enjoyed staying in a place that was clean and very near town and beach. We had plenty of room. Three bedrooms was necessary for 3 snoring sisters. Other Activities: Located just five blocks from the main beach, a favorite activity is to walk out to the lighthouse. We are open year-round. Contact us for renting just our upper or lower unit. Rates vary over the summer in both our lower and upper units but the amount quoted for a specific week is usually very close to accurate. For both units, the summer months run from a low of $1800 to a high of $2550 for the week of the fourth of July. Most weeks fall around $2300 to rent the entire house. We rent by the week Sunday to Sunday. In some cases, we only have availability left in our upper unit (usually around $750 in summer weeks) or lower unit (usually around $1550 in summer weeks). We are open year round and keep our calendar updated as much as possible. The only additional fee to the main price is a 2% fee added. That is the "out the door" price.